Graduation day is on the horizon and you just got your graduation cap—the same cap that everyone in your class will be wearing. You can stick with the original look or opt for a more personalized design. Use these five tips and a few basic items from your local craft store to create a cap that’s all your own! The night before graduation day can be oversaturated with a bittersweet mess of feelings. Excitement, anticipation, relief, stress, and anxiety are all common emotions to feel the night before you graduate, but that doesn’t make them any less heavy. Don’t add a graduation cap design to your list of worries. The worst thing you could do is put off this time-consuming project until the night before the big day, stay up all night trying to put it together, and end up snoring through the ceremony in a poorly-designed cap. Tip #2: Plan Ahead It’s always best to plan your design ahead of time to avoid a regrettable creation and a lengthy receipt. You may find that what you’re envisioning in your head doesn’t exactly transfer to the fabric and shape of your cap. In fact, some designs might be downright impossible. Put those art classes to good use and draw a couple loose sketches of your design. It’s also wise to confirm that every aspect of your vision can be accomplished. You might have an amazing idea of creating a photo collage of you and your friends on your cap, but do you have the time, tools, and know-how to make it happen? Tip #3: Make a List Once you’ve planned a practical and realistic design that you’re happy with, it’s time to make a list of the supplies you need. Write down every single item, from the embellishments to the craft tools. Will you need a glue gun? Will you need to order anything online? Consider every aspect of your project and create a list of each item needed. Anyone who has ever walked into a craft store unprepared will tell you that it was a terrible idea. If you don’t have a plan for your design and a list of items you need, you will get lost among aisles of brightly colored glitter paper, quirky picture frames, and fake flowers until you will emerge (hours later) with way more useless craft supplies than anyone could possibly need. 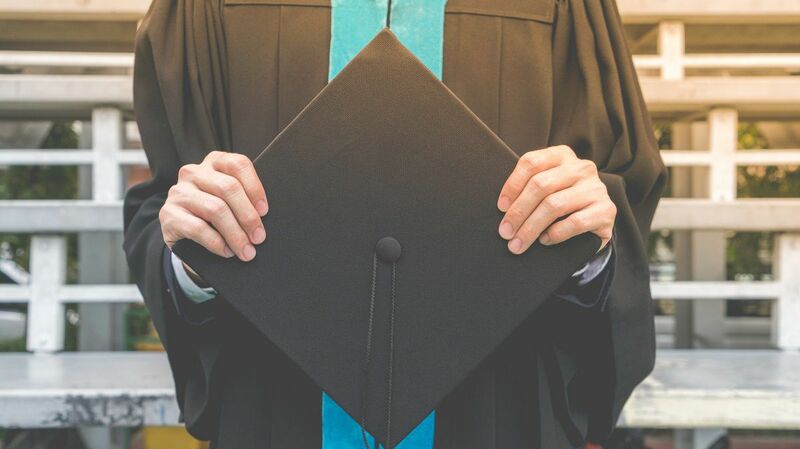 Tip #4: Don’t Rush It Plan ahead, collect your supplies, and begin decorating your cap with plenty of time available so you don’t have to rush the process. If you try to speed through your design, you are almost guaranteed a sloppy, sticky result that looks nothing like what you thought it would. Take your time. Spend a few minutes on it each day if you have to; just don’t rush it. By giving yourself plenty of time to decorate your cap, you’re more likely to end up with a design that you’ll be proud to have on your head. Additionally, if during the design process you make a mistake or you learn that what you had planned on paper doesn’t look as good on the cap, you’ll have the time you need to fix the error and make adjustments to your design. Tip #5: Make it Meaningful Clever quotes and borderline jokes are great and all, but we suggest you make your graduation cap meaningful to you. Decorating graduation caps originated as a way to wear your school experiences and best memories on your head for the big day! Personalize your grad cap in a way that will bring to life your favorite things about your years of schooling. If your favorite thing about school is that you’ll finally be leaving it, then plaster your cap with words of inspiration and hope for the future! The idea behind decorating your graduation cap is to express yourself, display your greatest memories, and symbolize your future. How you choose to do this is entirely up to you, but before you begin, don’t forget to plan your meaningful design ahead of time, make a list of supplies, and give yourself plenty of time to create a graduation cap that you’re happy with. Congratulations on your upcoming graduation! We wish you the best of luck in pursuing your goals and continuing your education! Find out more information about the courses at Independence University.